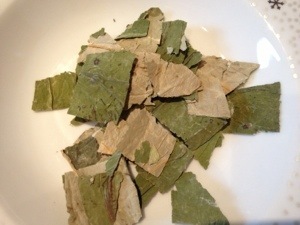 For the 28 days of February I tried the In Nature Teas, Slim Tea detox. 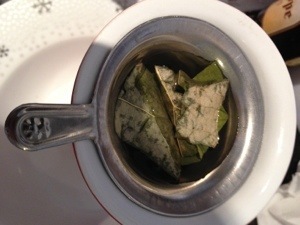 I’d read Cathy’s review of the tea over at Planet Veggie & was ready for the fact that this tea really is leaves. Big leaves, because I thought what was in teabags were the dried up leaves. But these are giant by comparison, actual chopped up chunks of leaves, and I was still amused by the size of them. The tea comes with a sheet I instructions and advice on how to brew the tea & also how to make the detox more effective. But I only skimmed through it and brewed my first cup. As there was loads if tea in the pack, I wasn’t worried about running out of tea before the end if the month, and I put what I felt was a good number of leaves in to make a decent brew. It’s a really nice light tea, not too strong taste, and it doesn’t leave a horrible coating in my mouth after drinking, like builders teas do. The detox was certainly a challenge, drinking tea instead of coffee was a massive struggle, although I didn’t seem to get any of the horrible headaches I have experienced when cutting out coffee previously. I also didn’t murder anyone, which is always a winner. I did get some really good nights sleep too, even with my 2 year old son trying his best to make me get up several times, I got up feeling quite refreshed and well rested. Part of the advice the sheet included gives is to try to cut out dairy, and this part it seems was the best advice, as I’m 90% certain that I’m lactose intolerant. How shall I put this, the air was certainly fresher around me during the detox, than previously. I really did struggle to loose weight this month though, and I failed my Dietbet. My weight went up and down all month, and I only lost 2lbs overall, but at several points I was down much more, and up much more. But I never expected the tea to work wonders and do the work for me, but my diet wasn’t terrible either, I’m going to chalk it down as “just one of those months” and not stress too much about it. Yes. This month was the 1st time I’ve felt like I’ve had enough energy to actually do some excersise, and go to the gym, I’m going to say that it’s because I got some really good nights sleep, and was certainly drinking 2L, or more, of water/tea a day. Plus cutting out dairy really has made a difference too. Probably not. I LOVE my coffee, and honestly didn’t manage the whole 28 days without a sneaky caffeine hit, and while the tea is really nice, it’s not enough to tempt me away from my coffee. 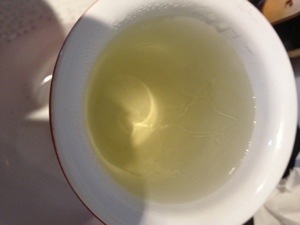 I’ll still drink the tea, even drinking 3+ cups a day, I still have lots of giant tea leaves left. And I have even considered swapping a coffee a day for tea for March. But I’m not going to do the whole 28 days again.